princewally's world: Ice Cube's Image....Inspiring? 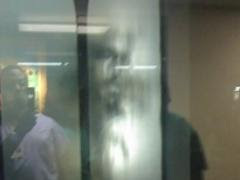 An image of Ice Cube in a glass hospital window has convinced one man that his wife's life isn't worth living, and reduced sick music aficionados to tears. Cruzada, who was one of several viewers to send an e-mail about the image to Local6.com, said his ex-wife was recently diagnosed with stage-3 cancer. "This was just a sign for me to not worry about what is going on in my life and that everything else is under control," Cruzada said. "It was an enlightening experience." Denial, the new cure for cancer. Denis Leary would be proud.